Saturday afternoon, we’d finished puttering around the house, and didn’t really want to waste a beautiful afternoon indoors. It was also late enough that we knew the kids wouldn’t last long, and we didn’t want to commit to a long expensive excursion if a breakdown were eminent. With small children, it’s easy to get caught up in MUST! BRING! EVERYTHING! because you never know what your kids are going to need if you’re out for a long day of sightseeing. We’ve been making an effort to be more minimalist not only in the accouterments we drag along for the girls, but also in our actual excursions. Ein Karem is technically part of West Jerusalem, but it feels like a tiny artist’s village tucked snugly among green hills. It is, supposedly, the town where John the Baptist was born. It’s a 15 minute drive from our house, full of cute cafes and brasseries, and most importantly, parking (if you can find it) and most of the attractions are free. We decided to give Ein Karem a try, knowing that we could be home in 20 minutes if the kids turned into disasters. Happily, they had as much fun as we did! Once we found parking, an adventure in and of itself, we climbed a hill to see the Church of the Visitation. It was well worth the hike. When you enter into the church grounds, your’e greeted by beautiful tile mosaics of prayers in languages from all over the world (Nigeria included). The kind monk who greeted us didn’t speak much English (and we, of course, don’t speak much Hebrew), but he was very patient and gentle with the kids, both of whom wanted to take advantage of the large flat spaces to run around, instead of sedately and respectfully enjoying the church. He was very understanding of their enthusiasm, and we were eventually able to convince the girls to hush. Once they were quiet and calmed, we took a peek at some of the church’s beautiful interior spaces. After exploring the area near the entrance, we climbed more stairs to visit the church itself. The Church of the Visitation is known for it’s beautiful tile mosaics, and it absolutely did not disappoint. 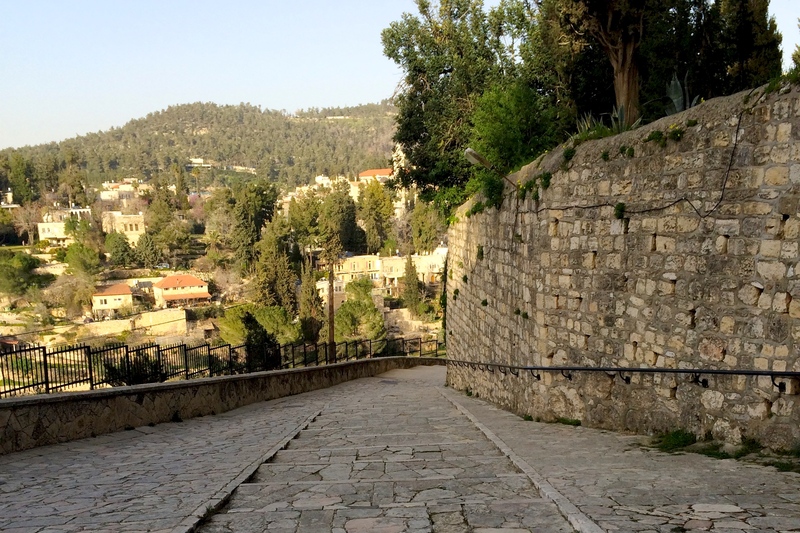 After visiting the Church of the Visitation, we traipsed back down the hill to the village of Ein Karem itself. It was packed with Israelis and tourists. all sitting at outdoor cafes and enjoying the beautiful weather. We’d hoped to visit the Church of John the Baptist, but by the time we’d stopped to get ice cream and climbed the hill to the church, it was closed to visitors. The ice cream was delicious, though.